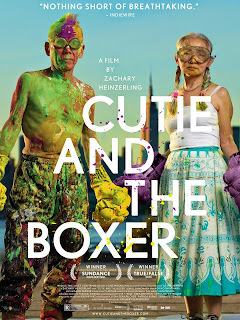 PennsylvAsia: Cutie and the Boxer at Harris Theater, June 6, 9, and 12. Cutie and the Boxer at Harris Theater, June 6, 9, and 12. A reflection on love, sacrifice, and the creative spirit, this candid New York documentary explores the chaotic 40-year marriage of renowned “boxing” painter Ushio Shinohara and his artist wife Noriko. As a rowdy, confrontational young artist in Tokyo, Ushio seemed destined for fame, but he is met with little commercial success after he moves to New York City in 1969, seeking international recognition. When 19-year-old Noriko moved to New York to study art, she fell in love with Ushio—abandoning her education to become the unruly artist’s wife and assistant. Over the course of their marriage, their roles shifted. Now 80, Ushio still struggles to establish his artistic legacy, while Noriko is at last being recognized for her own art—a series of drawings entitled “Cutie,” depicting her challenging past with Ushio. Spanning four decades, the film is a moving portrait of a couple wrestling with the eternal themes of sacrifice, disappointment and aging, against a background of lives dedicated to art. Cutie and the Boxer, as well as the other films in the series, is free and open to the public. The Harris Theater is located downtown at 809 Liberty Ave. in the Cultural District (map).